All the following software was written under the Linux and FreeBSD operating systems. All the packages excluding Repton can be ported easily to other operating systems with little or no change (most of them are built using GNU Automake/Autoconf). The Linux Repton game cannot be ported without rewritting the svgalib specific code; the portable, newer and better FX-Repton version may be used instead. This package contains the grammar for the ISO C language as specified by the ISO 9899:1990 standard and the grammar for the ISO C++ language as specified by the September 1996 ISO draft standard. Each grammar is composed by the lexical analyzer and the parser. The lexical analyzer (lexer.l) must be preprocessed by the flex utility while the parser (parser.y) by the yacc utility or a compatible replacement (e.g. bison). Go to the download page to get a copy of this software. 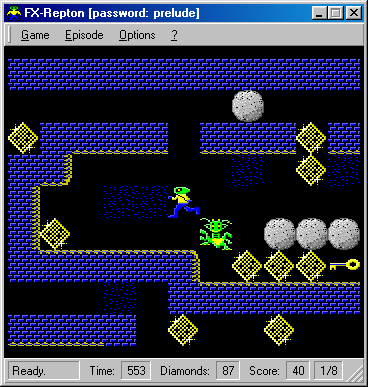 FX-Repton is a clone of the old BBC Micro Repton 3 game. I originally written it for Linux using the svgalib library (see Repton). Then I rewritten it to use the Qt and KDE libraries (see KRepton). Now I have rewritten it again to use the portable FOX Toolkit library. The original Repton 3 game was produced on the BBC Micro and was the third hit Repton game for Superior Software. For more information and other Repton clones, see the Repton Appreciation Society. 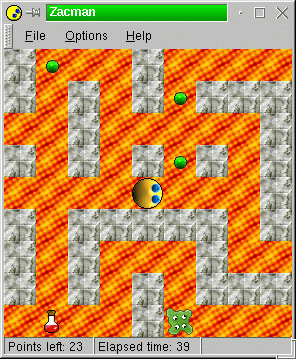 A level editor is also included. If you are interested about the tools I used to create this software, follow this link. 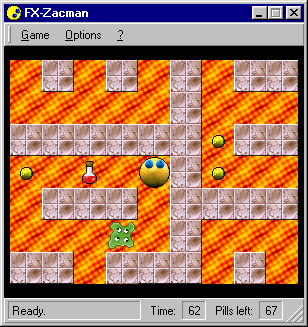 FX-Zacman is a maze game similar to Pacman. Originally I written it using the using the Qt and KDE libraries (see KZacman). Now I have rewritten it to use the FOX Toolkit library. hp48cc is a C-like compiler that translates the input code into the HP48 RPN language. The language recognized by the compiler is only a small subset of the C language, with some non-standard extensions, but powerful enough to write complex programs simply. SLisp is a simple Lisp interpreter that implements most of the common Lisp constructs in a few hundred lines of C code. It may be useful for learning the basis of the Lisp language. Zile is another Emacs-clone. Zile is a customizable, self-documenting real-time open-source display editor. Zile was written to be as similar as possible to Emacs; every Emacs user should feel at home with Zile. Zile is now part of the GNU project and can be found here. This version uses the Qt and KDE 1.0 libraries. A newer version of this software is FX-Repton. 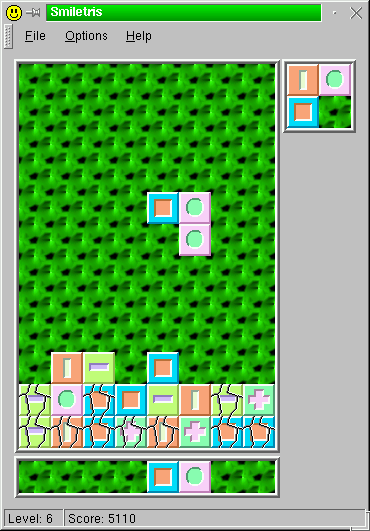 KSmiletris is a Tetris-like game written for the K Desktop Environment using the Qt and KDE libraries. As of KDE 1.1, it has been integrated in the games package of KDE. This version uses the Qt and KDE 1.0 libraries. A newer version of this software is FX-Zacman. 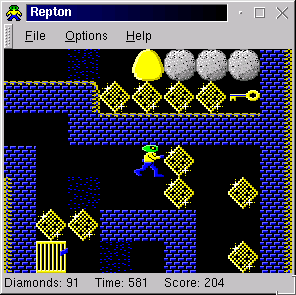 Repton is a clone of the old BBC Micro Repton game. I written it in two weeks using the svgalib library. This non-portable version has been obsoleted by FX-Repton. uMatrix is a very simple package written in two days useful for matrices introduction in high schools. It is able of compute the determinant of the matrix (of any order), compute the matrices product and some other minor operations. Since this package was written for an high school, don't expect too much. This Bourne Shell (/bin/sh) script simulates the most common commands (mail, cc, who, cat, rm, ls, ...) of the old AT&T UNIX System V operating system. It can be useful as a joke for a friend. The MiniQt library is a little Win32 API C++ wrapper inspired by the Troll Tech AS Qt multiplatform toolkit. It has been tested under Windows 98 with mingw32 and Cygwin B20. The MiniQt library was not designed for real development, but only for testing the freely available compilers found around the Internet. After a few days I was playing with the mingw32 compiler, I was bored by the amount of raw WIN32 API calls need to develop a simple Windows application. I have then decided to write a few C++ classes to include the common pieces of code found in a Windows application. Since Qt is my preferred C++ toolkit, I made the library similar to Qt, but not closer (no Qt code was included, anyway). A lot of time ago I have developed the "Daemon" screensaver that comes with the FreeBSD operating system. A copy of the source can be found here. For more information, please refer to the FreeBSD site.